Count on us for every cruise vacation possibility from mild to wild, over land and sea, including all-inclusive cruise tours, coach and rail adventures, shore excursions and more. Seek adventure on a journey that showcases everything that makes Alaska unique. Uncover the heritage of Native Alaskans. Gaze at blue-tinged glaciers and snow-capped mountains. See wildlife at play, and dive into local experiences with the North to Alaska enrichment program. Bonus Extras on many sailings that aren't available elsewhere, including onboard cash credits, free beverage packages, complimentary gratuities, reduced deposits, free wifi, cabin upgrades, special offers, Kids sail free or at reduced rates, 2 for 1 promotions and more. travel trade organizations including the Cruise Lines International Association and the Travel Leaders Group. Management and staff each have over 30 years experience in travel. with contagious enthusiasm for our work, here to help you plan the perfect cruise vacation. You'll find we're just like you, sharing one common dream, the dream of cruising and the spirit of the sea. Call today and let us plan your most memorable vacation experience ever. We'd love to help plan your next unforgettable cruise or vacation. Do you have a vacation in mind? Call us at 800.365.1445 to get started. Our brands help travelers plan the perfect vacation by finding answers, solving problems, and getting inspired. We share 20+ years of experience with destination focused content. Whether you're looking to book an all-inclusive land & sea package, or just a cruise, we can provide you with the best options available. We have access to the best choice and prices, Bonus Extras, and more that aren't available everywhere else. If you need help planning an upcoming cruise or you just have questions about a specific destination or trip, call us at 800.365.1445. With advice you can trust from someone who is not only a certified travel expert, but an avid traveler, with over 30 years experience and expertise. Browse one or more of our dedicated destination websites below for all the details. Take a voyage, then explore, journey, and discover an Alaska adventure. Explore the Distant Corners of Alaska From Anchorage to Denali. From Fairbanks to Copper River. From Whittier to Kenai. 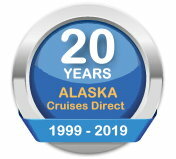 Over 150 Alaska Traveling, Tours, and Adventures. 7 Day Glacier Discovery Cruises, Plus 3-7 day Land Tours. Recognized by Princess as one of the top travel service providers in North America, Princess Cruises by Cruise Direct Online features 2019-2020 Princess Cruises top cruise deals to Alaska, the Caribbean, & Europe. Browse affordable Princess cruise deals, destinations & itineraries. Save up to 70% 150 worldwide itineraries. 350 worldwide ports. Free vacation planning from Princess Certified Cruise Experts. Not sure where to go? Then let us recommend some of the most popular and exciting cruises. Experience the dreamy beaches of the Caribbean, the charm and history of Europe, the rugged beauty of Alaska or the stunning marvels of the Galapagos Islands and discover the wonders of the world with a great cruise vacation with Royal Caribbean or Celebrity Cruises. Call and speak to a Royal/Celebrity vacation Planner. We travel to explore, to learn, to understand. At Viking, they believe travel should be more than just a trip, it should be a doorway to cultural insight & personal enrichment. These intimate, inclusive cruise itineraries are designed to help you explore nuances of your destination: its food, culture, people & customs. In Europe, you can take one of our Danube river cruises, or one of our Rhine river cruises. We also offer river cruises in France and Portugal. We hope that you enjoy exploring our many itineraries in Europe, Asia and Africa. Disney Cruise Line - Walt Disney World - Adventures by Disney -Shore Excursions and Sightseeing Tours. Never Pay Cruise Line Prices Again. Shore Explorers reveals over 5,500 Discount Shore Excursions and Sightseeing Tours priced as low as $29! Shore Excursion Reviews. Cruise shore excursions, tours, things to do, sightseeing tours, day trips and more. Cruises Beyond Compare, Savings Beyond Belief. Cruise Travelers like you get to cruise the world for less. Lower Deposits, Reduced Airfare, Senior Rates, Military Discounts, Mini- Group Rates, or Past Guest Deals not shown online or may not be available anywhere else! To get the latest up-to-the-moment special offers, discount prices, current fares, savings and cabin availability call us at 800.365.1445. Looking for a Group Cruise Vacation? Friends, & family have the most fun - especially on a group cruise. there are many reasons why groups choose to sail with us again and again. And, one good reason is our exclusive mini-group rates for as few as 3 couples! Call for details. No matter what kind of traveler you are, we've got a cruise for you. 350 ships, from classics to modern luxury. Over 12,000 sailings around the world and more options to fit your budget than anyone else. ✔️New England & the Southeast. Our friendly faces going to all kinds of places! While the high tech race moves forward, old fashioned expert advice is what Travel Direct Corporation offers consumers who visit our travel services web sites. and the best way to enjoy a holiday. At Travel Direct Corporation web sites, guests are in contact with a professional cruise travel advisor who provides the human touch that no database alone can provide. We believe technology, in and of itself can never replace the personal care and contact the human touch provides, but a careful balance of both, provides vacationers with a great resource of comprehensive cruise travel information. Travel Direct Corporation provides just that, a personal dimension to e-commerce, a community if you like for the leisure traveler used to dealing with real people. "I just wanted to thank you for all your help. Packer Expeditions was excellent and I would highly recommend them again for anyone looking to do a glacier hike. Also, we ended up being upgraded to an outside cabin... It was a truly welcome surprise to say the least. It made all the difference in the world both having a window (even though it was an obstructed view) and having a larger cabin. Alaska was totally awesome and we thoroughly enjoyed the land tours. All the coach drivers and tour folks were very knowledgeable and helpful. So next time we are looking for a cruise I will be in touch! Thanks again, Ann." " Our trip was excellent. The room, with the upgrades, was amazing! We saw many eagles (bald and golden), one bear, many whales, including one breach, seals, one bear, one wolf, moose and caribou, and many smaller animals.. If we travelled during salmon run, we probably would have seen more bear and eagles. The scenery is to die for, the vistas spectacular. The ship was great; service, food, etc were all great. Thanks for everything. " "Hello! I wanted to let you know how much we enjoyed our Mediterranean Greece trip and to ask you about a future vacation. First, our vacation was wonderful! Princess did a great job. Their excursions were well organized and enjoyable. We had something planned every day so we kept very busy. We took over 5000 pictures! It was warm 109 degrees in Rhodes, Greece but not humid so it was manageable. I have included a couple of pictures you might like. Now we are back to reality and already thinking about our next vacation. I saw an interesting trip to the Galapagos Islands aboard the Celebrity Xpedition. It includes 4 days land and 7 on the Ship. Thank you again for helping us book a great vacation!". The proof is in the details. Our Certified Cruise Travel Experts have 30 years extensive cruise planning and destination knowledge each, helping you plan the cruise that's right for you, offering a truly memorable and personalized experience. We're at your service from the beginning you contact us, to the end of your journey and beyond. They Make Complex Travel Simple to Understand and Plan! Raye & Marty are a husband and wife team with more than 30 years experience cruising the world. Their commentary has been quoted by MSNBC, CNN, Budget Travel, Chicago Tribune, the New York Times and in syndicated travel columns and online sites across the country. 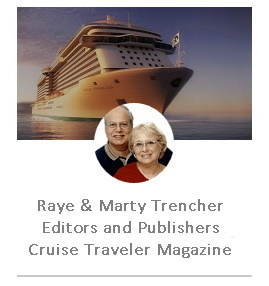 They are publishers of Cruise Traveler Magazine, and are also editors of Cruise Reviews & Reports. Their mission is plain and simple. To provide real-life accounts and expert advice, not just a flood of information. They literarily have cruised "round the world", sailing thousands of nautical miles, visiting ports of call, inspecting ships, sampling itineraries and critiquing shore excursions. to get group rates ( without joining a group! ), free upgrades, shipboard credits and other amenities or discounts. Get advise about tipping; packing; clothing; flights and schedule options; shore excursions, proper immigration documentations and much more. We are here for you with one-on-one support and personalized cruise vacation planning help. a professional Certified Cruise Vacation Expert is just a toll-free phone call away. Call us today at 800.365.1445. "Search for advice from cruise veterans. Consider joining an online forum that gives cruise advice. Cruise Together, for example, has more than 70,000 members who are willing to share their tips and experience. It's free to join, and members are eligible for special deals and discounts. so please be sure to join us! Just call 800.365.1445 anytime from 7 to 9 pm ( on the east coast ) ( 4 to 6 pm ( on the west coast ) Monday- Friday. USA based calls only. The call is free and so is the advice. 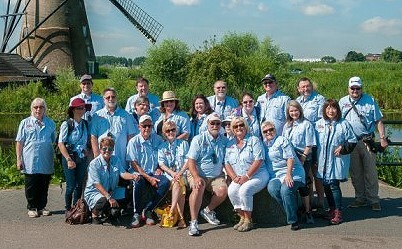 Azamara Club Cruises, Viking River Cruises, Viking Ocean Cruises, AMAWaterways and Crystal Cruises. but leave you with great new ideas and insider knowledge in new and different ways, to get the most out of your vacation. Call us at 800.365.1445 to get started. annually, and is the largest seller of luxury travel, cruises, river cruises and tours in the travel agency industry. The network includes nearly 7,000 Associates and Member travel consultants in the United States and Canada and represents more than $17 billion in annual sales volume. COMBINING OUR HOSTED CRUISES AND OTHER ADDED AMENITY DEPARTURES, WE HAVE OVER 3,500 DEPARTURES, TO 74 COUNTRIES, ON 18 CRUISE LINES! Let us connect you with a Certified Cruise Vacation Planner, an experienced cruise expert! Our destination-focused websites offers travelers not only a content-rich online experience, but access to certified cruise travel professionals with a wealth of knowledge and expertise. We have Certified Cruise Experts who are eager to help you sort through all your options, answer all questions, give you their best advice and help you book your cruise or cruise tour. Our staff have years of hands-on "been there done that" destination experience and expertise in cruising. ...and even if you choose not to book a cruise with us, that's ok. We're pleased to share our own cruising experiences with you, no matter what. The cruises shown on this web site are capacity-controlled and similar deals may be available from competing online, neighborhood travel agents, as well as the cruise line directly. All rates are per person for an inside cabin unless otherwise stated, and include port charges. Prices may vary by departure date. Please note these recent deals were limited-time offers, when we searched the Internet. You will need to click on an available link to check what's on offer today, to stay updated on recent deals, and to take advantage of opportunities to save before they are sold out or their time is (or was) up. Prices and availability are subject to change and offers may be withdrawn, by the suppliers at any time. There is no guarantee that these rates, free extras or special amenities will be available at the time of your search or actual booking. Use this information as a starting point in your vacation planning process. Check with us or the cruise line directly for the latest up-to-date-offers.